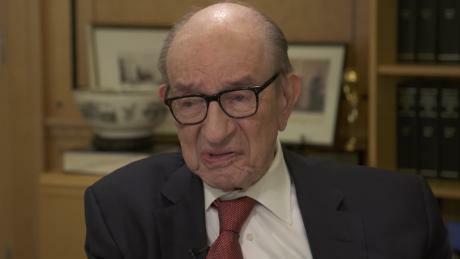 Former Federal Reserve chairman Alan Greenspan told CNN that it may be time for investors to "run for cover" - after massively hedging his language to include the possibility of further market gains before a painful correction. "It would be very surprising to see it sort of stabilize here, and then take off," Greenspan told CNN's Julia Chatterly, adding that while markets could still go up further, "At the end of that run, run for cover." Former Fed Chair Alan Greenspan warns investors "Run for cover"
Markets have struggled to maintain altitude in Q4 - with the S&P 500's late September gains of more than 9.5% evaporating to -4% YTD as of Tuesday, after closing at its lowest level since October 2017 on Monday. "The volatility is a function of how we speak, think and feel — and it's variable," said Greenspan. "Unless you can somehow radically change human nature and how we respond, this is what you'll always get and have been getting. You have to count on it, if you're going to understand how the market functions." President Trump in recent weeks has warned the Fed against further tightening - sentiment which billionaire hedge fund manager Stanley Druckenmiller and former Fed member Kevin Warsh wholeheartedly agree with. "The central bank should pause its double-barreled blitz of higher interest rates and tighter liquidity," wrote Druckenmiller and Warsh in a recent Wall Street Journal Op-Ed. On Tuesday, Trump tweeted: "I hope the people over at the Fed will read today's Wall Street Journal Editorial before they make yet another mistake. Also, don't let the market become any more illiquid than it already is. Stop with the 50 B's. Feel the market, don't just go by meaningless numbers. Good luck!" On Monday Trump tweeted that it was "incredible" that the Fed was considering a rate hike in light of a very strong dollar and "virtually no inflation." Greenspan, meanwhile, told CNN that a key factor in recent volatility has been a "pronounced rise in real long-term interest rates," and that the United States may be in store for a period of stagflation, which he called "a toxic mix" of high inflation and high unemployment last seen in the 1970s and early 1980s. "How long it lasts or how big it gets, it's too soon to tell," said Greenspan. "We'll know it when we get on top of it." Greenspan's comments mocked far and wide. David Rosenberg tweeted: "When the architect of the 'Greenspan put' tells investors to "run for cover" as he did today on CNBC, you know that finally we have a bona fide contrary buy signal!" When the architect of the 'Greenspan put' tells investors to "run for cover" as he did today on CNBC, you know that finally we have a bona fide contrary buy signal! I am now more bullish. Alan Greenspan is a great contrarian indicator.